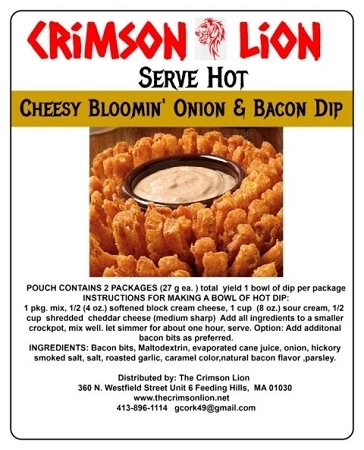 Bloomin Onion & Bacon Hot dip Mix Bloomin Onion& Bacon warm dip. This warm dip mix makes a delicious tasting dip. Add in cream cheese, sour cream and Cheddar cheese for a warm dip. Add bacon bits or real bacon as desired. Great with Nachos or Tortilla chips. We enjoy on steak tips or mixes or a baked potato topper. Each pouch contains two dip mix packets and makes enough for 1 bowl of mix each packet. Use a crock pot for warming the mix.